In presenting this, the~ nineiteenthi volume of the Semninole, to you, the students, alumni and faculty of 'the University of Florida, we, 'the editors) hope that it will in some small way help 'to preserve 'the memories and associations of 'those days which in all probability will be recalled as 'the most pleasant and colorful of your life. lIlt has been our constant eno, deavor 'to mirror as interestingly and accurately as possible in prose and picture, 'the life and activities of 'the University during 'the past year. tors can ascertain, thoroughly accurate. sense of personal loss that the stuo dents of the University learned of the death of their president, Dr. Albert Alexander Murphree, December 20, 1927. He was a man of national prominence, as is proven by his presio dency of the National Association of State College Presidents, yet he was also the personal friend of his stuo dents and faculty. He was a man with the vision to see into and prepare for the future, yet he was equally capable of handling the many minor details connected with the management of an University. 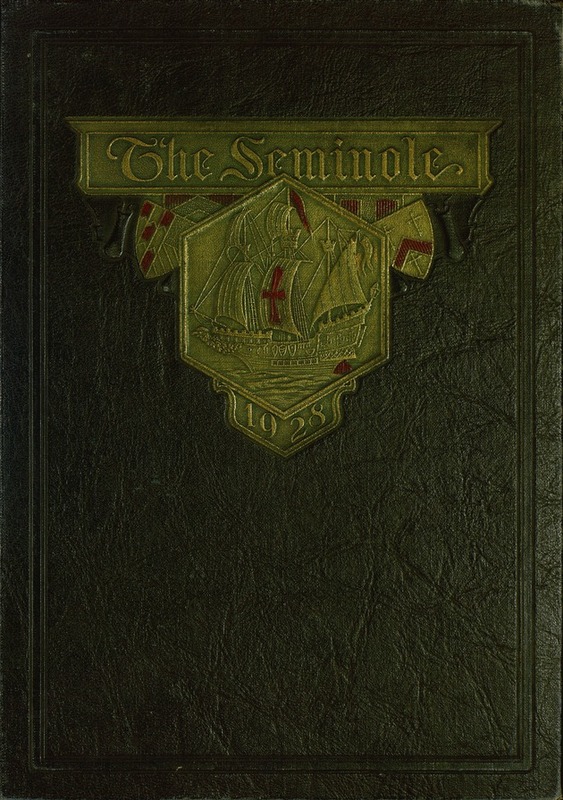 So, as an expression of a small part of our admiration and eso teem, the student:body lovingly dedio cate this, the nineteenth volume of the Seminole, to the Memory of Dr.
Death, be not proud, though some have called thee Mighty and dreadful, for thou are not so; For those whom thou thinkest thou dost overthrow Die not, poor Death; nor yet canst thou kill ine. From rest and sleep, which but thy picture be, Much pleasure; then from thee much more must flow; And soonest our best men with thee do goRest of their bones and souls delivery; Thou art slave to fate, chance, kings and desperate mecn, And dost with poison, war, and sickness dwell And better than thy stroke. Why dweilest thou then? One short sleep past, we wake eternally, And death shall be no more; Death thou, shalt (ile--John D~unne(. The state suffered an almost irreparable loss in the death of Owen Francis Burger, D.Sc., on Januo ary 26, 1928. Dr. Burger, who was plant patholoo gist of the Florida Agricultural Experiment Stao tion and the State Plant Board, had greatly bete tered the agricultural conditions of the state, and he was conducting experiments which would have improved them still more. He was a deeply relio gious man and one greatly liked and admired by all who came into contact with him. William Wiley Hollingsworth, Ph.D., was a man of tolerance, deep sympathy, and extreme generosity. Dr. Hollingsworth had been an ine structor at the University since 1925, his especial field being local and state politics. His two hobo bies, he often declared, were political science and baseball, and he was a close student of both. He was exceptionally popular with his students and his death on January 1, 1928 came to them as a great shock. may have in the interest of higher learning. the people of the State of Florida. of a beautiful forest the University of Florida was established. This new site was chosen because of its central location, ideal for a State college. Additions have been made to the original campus until at present it composes a tract of nine hundred and fifty-three acres. The founders of the University exercised great foresight when they planned the entire work before starting construction on a single building, preserving all the natural beauty of the luxuriant forest, erecting edifices planned on the design of Gothic architecture so as to create a campus of surpassing beauty. When the University held its first session it consisted of the College of Arts and Sciences, the Agriculture Experiment Station and the Normal School. direction of the Dean of the Colle-e.
School of Pharmacy provided for in 1923 was made a separate College. 1 -7 ...... ... ..
. .. ............. ..... ... . ... ... ..
jf'_, (ERVING many purposes, Ti-iE COLLEGE %ZA-,IOF ARTS AND SCIENCES has for its main purpose and aim, the impartin-, of cul ture and refinement to its students. The aim of this College is to prepare for life, but not so directly and immediately as the professional schools. It is a longer, yet, a better road, for those who are able to follow it, to distinction and ultimate success in almost any calling. Especially in the case of learned professions, it is becoming clearer that a man must first get a liberal education, if possible, before entering upon his professional studies. to specialize in some branch according to his inclination and in the furtherance of his plans. the purpose and aim of the College of Arts and Sciences is to train the mind and strengthen the intellect, to build up ideals and establish the character, to enlarge the vision, to ennoble the thoughts, to increase the appreciation of the beautiful and true, and add charm to life and piquancy to companionship, to make a man a decent fellow, a useful citizen, an influential member of society in whatever community he may live and in whatever pursuit he may take his way. To accomplish this purpose the College has gathered together a faculty of men ranking with the foremost educators of today. Through their efforts the College has prospered. RAINING scientific farmers and encouraging them to take up their work in this state is the prime objective of the College of Agriculture. The aim of the College is to afford the best possible opportunity for gaining technical knowledge and training in the art and science of agriculture. About one third of the students' time is taken with technical studies and the other two-thirds devoted to the cultural studies and basic sciences. In this College there are courses designed to treat of those plants of tropical origin and development with special stress being placed on t e fruits and produce of Florida, showing how they may be raised more abundantly and scientifically. and gives short courses of a few weeks duration to meet the needs of these boys throughout the State. Each year there gathers here, many boys and young farmers from all parts of the State to take part in these helpful instructions. In connection with the College of Agriculture is the Florida State Experiment Station and an exceedingly large farm in which there is shown practical demonstration of the advantages of scientific farming. The college was established under the Acts of Congress creating and endowing institutions for the liberal and practical education of the industrial classes. Recognition of agriculture as a branch of collegiate instruction is a distinctive of schools thus founded. In nearly every section of the state the results of the training of scientific farmers may be seen in the advanced methods for operating farms and the improvement in the quality and quantitity of the produce. and made co-equal in every respect with the other colleges of the University. The degree of Bachelor of Science is awarded in each of these fields. The purpose of the College is to prepare students to become business executives, journalists and social service administrators. given in the last two. ARCHITECTURE NE of the first colleges to be established on the campus of the University of Florida was the COLLEGE OF ENGINEERING. During the period of its existence it has been under the direction of Dr. J. 'Ago R. Benton. Under his administration it has attained to a high rank in colleges of its kind. Students of this College are afforded the best technological training of four-year courses in chemical, civil, electrical and mechanical engin peering, leading to corresponding Bachelor's degrees in engineering. These courses are similar to those of other American engineering schools of college grade. The graduates are prepared to fill such positions as are usually allotted to young engineers. DEAN J. R. BENTON At present the College of Engineering occupies Engineering Hall, including the large wing, and the newly constructed Engineering laboratory building. Facilities have been largely improved to accommodate the great demand for the courses offered. in ultimate success in that profession. is in charge as Director. opportunities in the useful arts. HE COLLrGE OF LAW through its able faculty presents an open gateway to the vast realm of knowledge embraced in the theory, science and practice of law. Well has it been said that "the common law is a great storehouse of knowledge, out of which each man draweth according to his capacity." The College of Law undertakes, not to make lawyers, but to provide the means wherewith they shall make themselves. It says to those who knock, "Here are my wares; come and enter--2', and to this end provides a system of judicial instruction that acknowledges no superior. colleges of America. Success for the College has been accomplished through the untiring efforts of the eminent members of its faculty. press on to the High Calling. SWO-FOLD in its purpose, the COLLEGE OF PHARMACY gives preparation in how to live and how to make a living. As an associate member of the American Association of Colleges of Pharmacy, the College receives full recognition from all State Boards requiring attendance in a school of pharmacy as a prerequisite to examination and registration. Courses offered in the College meet the highest requirements of pharmaceutical instruction, and in fact, are in excess of the require~ ments of the American Association of Colleges of Pharmacy. All professors in the College teaching strictly professional subjects hold the Doctor's degree. For the purpose of training pharmacists, DEAN T. R. LEIGH the College maintains a three year curriculum. is designed to train men for positions in food and drug laboratories or as manufacturing, phar- macists. in Pharmacognosy and Pharmacology should s.
qualify the graduate to act in the capacity ofpharmacologist or inspector of crude drugs with a manufacturing concern or with the Federal :TrCustoms Service, or as a pharmacologist for drug manufacturing house or hospitals. ample evidence of the existing need for such institutions. Foremost among the most successful of these institutions is the TEACHERS COLLEGE Of the University of Florida. Since its inception it has experienced a steady and healthful growth. Evidences of its value may be seen in the advancement of the school system of the State. Specifically, the TEACHERS COLLEGE prepares its students for positions as teachers, principals, supervisors and county or city superintendents of public instruction. MAJOR A. C. TIPTON, U.S.A., Commandant of Cadets and Professor of Military Science and Tactics CAPTAIN F. M. BRENNAN, U.S.A., Assistant Professor of Military Science and Tactics CAPTAIN E. M. YON, U.S.A., Assistant Professor of Military Science and Tactics CAPTAIN C. S. WHITEHEAD, U.S.A., Assistant Professer of Military Science and Tactics CAPTAIN W. A. RAWLS, U.S.A., Assistant Professor of Military Science and Tactics CAPTAIN JAMES M. MORRIS, U. S. A., Assistant Professor of Military Science and Tactics FIRST SERGEANT K. G. MCCALLISTER, D.E.M.L. SERGEANT D. B. HUNDLEY, D.E.M.L. SERGEANT W. D. KLINEPETER, D.E.M.L. SERGEANT C. H. BELL, D.E.M.L. The work of the Athletic Department under the direction of Captain E. M. Yon, a Florida product, is a matter of pride and joy to all alumni and students of the University of Florida. Captain Yon has worked untiringly in the interest of Gator Athletics and the results speak for themselves. In an effort to serve all the people in the State, the Extension Service of the institutions of higher learning in Florida, is made up of a General Extension Division and an Agricultural Extension Division. The General Extension Division represents the Colleges of Arts and Sciences, Education, Engineering and Law of the University, and the College of Arts and Sciences and the Schools of Education, Physical Education, and Music of the State College for Women. The Extension Teaching Department supervises Correspondence-Study, Class Study, Club Study and Short Courses. The Public Welfare Department assists with Conferences and Institutes, Surveys and Colnmunity Studies. The Department for Instruction by Lectures and Public Discussion conducts the High School Debating League and State Declamatory Contests. The General Information and Service Department has charge of tie Public Information, Visual Instruction, School and Community Center Bureaus and Extension Publications and Traveling and Package Library Service. .. .. . .. .
Prom, President Senior Class '28, U. of F. Band (1, 2), Executive Council (5). B. K. ROBERTS, Sopchoppy. Law, LL.B. Delta Cli. Phi Alpha Delta, Blue Key, John Marshall Debating Society, Democratic Club, Executive Council (5). Junior Oratorical Team, Finance Committee of Executive Council, Vice-President Senior Class (5). (4), Major R. 0. T. C. Battalion (4). IRWIN BERNARD ANDERSON, St. Petersburg. Arts and Science, A.B. Delta Tau Delta, Scabbard and Blade, Pi Delta Epsilon, L'Apache, Beefsteak Club (2, 3, 4), Inter-Fraternity Conference, St. Petersburg Club, Alligator (1), Blue Gator (4), Executive Council (3). 1st Lieutenant R. 0. T. C. (4). HARRY YERVANT BAGHDOIAN, Gainesville. Law. LL.B. Phi Kappa Phi, John Marshall Debating Society (1, 2, 3, 4). FREDERICK ERNEST BAETZMAN, Chicago, Ill. Agriculture College, B.S.A. Alpha Gamma Rho. Phi Mu. Agricultural Club (Vice-President 3, President 4), University Band (3, 4), Lyceum Council (3), Executive Council (4), U. of F. Orchestra (1, 2, 4), Masqueraders (3). FRED R. BAISDEN, Andalusia, Ala. Law, LL.B. Kappa Sigma, L'Apache, Serpent Ribbon Society, John Marshall Debating Society, Auburn (1, 2). MERLE OLIVER BARND, St. Petersburg. Business Administration, B.S.B.A. Mizpah Club, Farr Lit., F. F. F. Club, Wrestling (1, 2). CECIL DUPUIS BECK. New Smyrna. Arts and Science, A.B. Sigma Nu, Pirates, Blue Key, Sigma Delta Psi, Black and White Masque, "F" Club, Athletic Council (3, 4). Football (1, 2, 3, 4), Baseball (1, 2, 3, 4), Track (2, 3, 4), Alternate Captain Football (4), Captain Baseball (4), Winner of Norris Trophy (3. 4). BRYANT BEASLEY, Umatilla. Engineering, B.S.E.E. Benton Engineering Society. JAMES LOUDEN BORLAND, Ocala. Arts and Science. B.S. Kappa Alpha. (2), John Marshall Debating Society, Vanderbilt University 1925. Chemical Society, Debating Team (1. 2). CHARLES HENRY HARDIN BRANCH, JR., Tampa. Arts and Science, A.B. Associate Editor of Blue Gator. Managing Editor of Blue Gator. WILLIAM JERROLD BULLOCH, Monticello. Business Administration, B.S. in Journalism. Sigma Phi Epsilon, Scabbard and Blade. Commerce Club, 2nd Lieutenant Company 'D", R. 0. T. C.
KERMIT WILLIAM CALLAHAN, Coral Gables. Business Administration, B.S.B.A. Commerce Club, 1st Lieutenant Company "E", R. 0. T. C.
OLIN CAMPBELL, Tampa. Engineering, B.S.C.E. Omega Upsilon Theta, Sigma Tau, Benton Engineering Society, A. S. C. E.
THOMAS WILLIAM CANTEY, Quincy. Arts and Science, A.B. Kappa Alpha, Theta Ribbon Society, Pirates, Phi Kappa Phi. JOSEPH ASHLEY CAWTHON. Tallahassee. Business Administration, B.S.B.A. Theta Cbi, Scabbard and Blade. Captain Company "17", R. 0. T. C., Executive Council (4). ARCHIBALD LEWIS CLAYTON, JR., Jacksonville. Engineering, B.S.C.E. Benton Engineering Society, A. S. C. E., Glee Club (2, 3, 4). Librarian (3), Secretary (4). JOHN M. COBB, Gainesville. Agricultural College, B.S.A. Episcopal Club (President 3), Math Club (2), Captain Company "B" (4), RI. 0. T. C.
JASPER NEWTON COPELAND, Alachua. Teachers, A.B.E. WAYNE BYRON DALE, Gainesville. Arts and Science,.A.B. CHARLES B. DAVIDSON, JR., Jacksonville. Business Administration, B.S.B.A. Alpha Tau Omega, Alpha Kappa Psi. Scabbard and Blade. Carnegie Tech (2, 3), Carnegie Tech Band (3). Carnegie Tech Glee Club (2, 3), Auburn Band (1), U. of F. Glee Club (4), 1st Lieutenant Company "A", 4th Corps Area Rifle Team, National Matches '27. WILLIAM HARPER DAVIDSON, Tallahassee. Engineering, B.S.E.E. Kappa Alpha, Scabbard and Blade. Pirates, Serpents, Inter-Fraternity Conference, Track (2. 3), 2nd Lieutenant 0. R. C.
A. CLARKE DEAN. Whitney. Engineering, B.S.C.E. Benton Engineering Society. A. 1. E. E., Ministerial Club, Math Club, President Presbyterian Student Class. RICHARD HARRY DEBOER, New Port Richey. Pharmacy, PH.C. (3), Treasurer Debating Council (3). WILLIE J. DEHOFF, Jacksonville. Law, LL.B. Newman Club, "F" Club, John Marshall Debating Society, Football (3, 4). JOHN ROBERT DILLON, JR., Atlanta, Ga. Business Administration, B.S.B.A. Kappa Sigma, Feature Editor of Seminole (3), Intra-Mural Manager (3), 2nd Lieutenant Company "C" (4). FRANK BRITT DOWLING, Miami. Law, LL.B. Phi Theta, Phi Alpha Delta, Phi Kappa Phi, transferred from Mercer University '26. TRUSTEN POLK DRAKE, JR., Ocala. Agriculture, B.S.A. Kappa Alpha, Alpha Zeta, Thyrsus. ALBERT GILCHRIST DRIGGERS. Wauchula. Agriculture, B.S.A. Ag. Club, Hardee County Club, Wrestling (3, 4), Soccer (2, 3), Live Stock Judging Team (3, 4). WALLACE CLARENCE DURHAM, Bristol. Teachers, A.B.E. Masonic Lodge, Peabody Club (1, 2, 3, 4), Monitor "C" Section Thomas Hall, Student Assistant Education. 0. L. DURRANCE, Pierson. Teachers, B.S.E. Kappa Delta Pi. Peabody Club, Graduate Club. BORDEN McLEOD DYER, West Palm Beach. Law, LL.B. Kappa Sigma, Phi Kappa Phi. WILLIAM HARRISON EASTON, Tampa. Engineering, B.S.M.E. Phi Kappa Tau, Band, A. S. M. E., Benton Engineering Society. WILLIAM EDELSTEIN, Gainesville. Engineering, B.S.E.E. Tau Epsilon Phi, Benton Engineering Society. A. I. E. E., Alachua County Club. JUSTO JOSE FABREGA, Panama City, Panama. Agriculture, B.S.A. LEON FITZPATRICK FERNALD, Tarpon Springs. Arts and Science. B.S. Delta Chi, Kappa Gamma Delta. Pinellas County Club. Leigh Chemical Society. Commerce Club. Glee Club, Y. M. C. A., Manatee County Club, College Football (1). WILBUR Y. GARY, Ocala. Arts and Science, A.B. Sigma Delta Psi, Farr Literary Society, Flint Chemical Society, Baptist Club, Ocala Club. JOSEPH MARIA GOMEZ, Tampa. Law, LL.B. Alpha Omega, John Marshall Debating Society (2. 3, 4). JEROME ALBERT GRATIGNY, Miami. Arts and Science, A.B. Order of the Pyramid. ARTHUR SYLVESTER GREEN. Perry. Teachers, A.B.E. Phi Kappa Phi, Kappa Delta Pi. JOHN FLEMING HUDDLESTON. JR., Sanford. Engineering. h.S.C.E. Phi Kappa Phi. Sigma Tao (Treasurer 4), A. S. C. E., Benton Engineering Society, Assistant in Physics (2). KENNETH HAGGART, Miami. Business Administratio.. B.S.B.A. Order of the Pyramid, Phi Sigma. CHANCEY GEORGE HAMILTON, Ft. Lauderdale. Pharmacy, PH.C. 'Sigma Lamba Tau, Lecgh Chemical Society. WILLIAM CURRY HARRIS, Key West. Arts and Science, A.B. Sigma No. 2nd Lieutenant, 0. R. C.
KERMIT THOMAS HART, Tampa. Business Administration. M.S. in B.A. Student Assistant (2. 3, 4), Tampa Club, Graduate Club. LAWRENCE TRACY HARR1NGTON, Atlantic Beach. Teachers. A.B.E. JOHN MELVIN HEARN, Miami. Law, LL.B. Phi Alpha Delta, Ag. Club (1, 2, 3). John Marshall Debating Society (1, 2, 3, 4), President John Marshall (4), U. S. Army 1918. CARL DANIEL HENDERLY, Ocala. Engineering, B.S.C.E. Omega Upsilon Theta. Phi Kappa Phi. Sigma Tau. Psi (Secretary 3, 4), Glee Club (2i, Orchestra (2), Band (1, 2, 3, 4), (Manager 4), Chairman Lyceum Council (4J, Benton Engineering Society, A. S. C. E.
WILLIAM T. HICKS. Pensacola. Business Administration, B.S.A. and M S. i BA. Alhpa Kappa Psi, Beta Sigma. Commerce Club, Varsity Debating Squad, Research Assistant in General Extension Division. Clark Club, Transfer Mississippi A. & M. College. WILLIAM LOGAN HILL, Gainesville. Arts and Science, A.B. Sigma Chi, Phi Kappa Phi, Inter-Fraternity Conference (3, 4), President Serpent Ribbon Society (4). WILLIAM FRANKLIN HOBBS, Tampa. Law, LL.B. Alpha Tau Omega. MERTON STUART HORRELL. Arcadia. Arts and Science, A.B. ; Law, LL.B. RAYMOND HOLT HOWARD, Gainesville. Agriculture, B.S.A. Ag. Club, Baptist Club. Baptist Choir (2, 3, 4), President B. Y. P. U.
RICHARD MOIR HUTCHINGS. Riverview. Business Administration, B.S.B.A. Theta Xi. Blue Gator (4. WALTER HERBERT JACKSON, DeLand. Business Administration, B.S.B.A. ROSS EVERETT JEFFRIES, Gainesville. Teachers, B.S.E. Peabody Club, Hiwassee College (1, 2), University of Tennessee (3). JETT M. JENKINS, Green Cove Springs. Engineering, B.S.E.E. (4), Democratic Party. Geneva College (1), Glee Club (3). WILLIAM HUGHES JOHNSON, Tampa. Engineering, B.S.E.E. Alpha Tau Omega, Sigma Tau. President of A. I. E. E., Secretary-Treasurer of Benton Engineering Society (4). REGINALD MAX JONES. Lake Wales. Agriculture. B.S.A. Alpha Gamma Rho, Ag. Club. BIRKETT F. JORDAN, Gainesville. Law, LL. B3. Phi Delta Theta, Track Manager (2). Society, Pan-Hellenic Council, University Orchestra, Law Debating Team. 1st Lieutenant Company "C" (4). HARRY HOUSTON LAPHAM, Miami. Business Admiinistratiun, II.S.B.:k. 2nd Lieutenant, 0. R. C.
LAWRENCE JOHN LARSON, Lakeland. Agriculture, B.S.A. (4). Ag. Club. Freshman Football. Varsity Football (2. 3), Democratic Club. RICHARD ABBOTT LAWRENCE, Melbourne. Arts and Science. A.B. Alpha Delta, Scabbard and Blade. Sigma Delta Psi, Varsity Track Team (2, 3), Captain Track Team (4). "F" Club, University of Florida Orchestra, 1st Lieutenant, Company "C". LEWIS ALLEN LANCASTER. St. Petersburg. Business Administration, B.S.B.A. Alpha Kappa Psi, Beta Sigma, Phi Kappa Phi. Commerce Club. St. Petersburg Club. REX E. LEE. Center Hill. Engineering. B.S.E.E. Theta Kappa Nu, Phi Kappa Phi, Sigma Tau, Scabbard and Blade, Baptist Club (President 3), Benton Engineering Society, A. 1. E. E., Soccer (1, 2, 3. 4), 2nd Lieutenant, 0. R. C.
HERBERT J. LENTHNER, Millview, Teachers. B.S.E. CHARLES CABELL LORRAINE, Jacksonville. Business Administration, B.S.B.A. Farr Literary Society, Hampden-Sidney College (1, 2). CLIFFORD A. LYLE, Pensacola. Engineering, B.S.M.E. Phi Kappa Tau, Benton Engineering Society, A. S. M. E.
FRED W. McCALL, JR., Miami. Arts and Science, A.B. Sigma Phi Epsilon, University Band (1, 2), Manager Floridian's Orchestra. HUGH McCALL, Tampa. Business Administration, B.S.B.A. Commerce Club (2, 3, 4). (Treasurer 4), F. F. F. Club, Tampa Club. JAMES MILTON McCLAMROCH, Gainesville. Arts and Science, B.S. ROBERT M POWLLE MAJORS, ON St.keterbur BusineAdinigro, S..B..
Theta Cli Epeiln Ribbnd Society. Pi appa pilcond Wlhit Mapasi, Blue Key, (Presi dent 7), Farr Literary Society (President 4). Literary Editor of Seminole (3), Secretary Junior Class, Democratic Party, Student Instructor in Spanish, History, and Political Science. DONALD RAY MATTHEWS. Hawthorne. Arts and Science, A.B. Sigma Phi Epsilon, Alpha Phi Epsilon, Tau Kappa Alpha, Scabbard and Blade, Blue Key, Glee Club (President 4), Y. M. C. A. Cabinet, Varsity Debating Team (2, 3, 4), Chancellor Honor Court (4), Cheer Leader (3), Democratic Party, F. F. F. Club, Ministerial Club, Executive Officer Company "B", R. 0. T. C.
MEMORY MARTIN, Gainesville. Teachers, A.B.E. Georgia Tech (1, 2, 3). HENRY HARRIS MEADOR, Miami. Arts and Science, A.B. Delta Chi, Kappa Gamma Delta, Miami Club, International-Relations Club. GEORGE ALFRED MERRIN, Plant City. Agriculture, MN.S. in A. Kappa Alpha, Scabbard and Blade. Thyrsus, "F" Club, Graduate Club, Athletic Council (VicePresident 4), Football (2, 3, 4), Executive Officer Company "C". R. 0. T. C.
BASCOMB F. MIZELL. Gainesville. Business Administration, B.S.B.A. (4), Supply Captain, R. 0. T. C., Democratic Party. EMANUEL MILLMAN, Gainesville. Law, LL.B. Tau Epsilon Phi, "F" Club, John Marshall Debating Society, Varsity Basketball (1), Law College Basketball (1). JOHN KEENER MIZELL, Gainesville. Business Administration, B.S.B.A. Delta Tau, Scabbard and Blade, Blue Key. Chairman Military Ball Committee (4). Vice-President Junior Class, Captain Company "A", R. 0. T. C.
ROBERT THOMAS MILLER. Welborn. Teachers, B. S. E.
Peabody Club, Teachers College Basketball (2), Championship Indoor Baseball Team, President Peabody Club, 1st Lieutenant Company 'F", R. 0. T. C.
WILLIS WILLIAM MIDDLEKAUFF, Orlando. Law, LL.B. Alpha Tau Omega, Blue Key, Pirates, 'F" Club, Orange County Club, Freshman Football, Varsity Football (2. 3. 4). Basketball (1), Freshman Boxing, Varsity Boxing (2, 3). ARVEL LEWIS MORGAN, Mayo. Arts and Science, A.B. Scabbard and Blade. Kappa Delta Pi, Phi Sigma, Leigh Chemical Society, Peabody Cl~ub, International Relationship Club, Baptist Club, Y. M. C. A., Class Football (1), 1st Lieutenant Company "B". R. 0. T. C.
LELAND WILLS MOON, Wewahitchka. Teachers, A.B.E. Peabody Club. VEDASTA ZABALA MUNOZ, Dagupan, Pangasinan, P. I. Agriculture, B.S.A. ('26) ; M.S.E. ('28) Leigh Chemical Society, President Cosmopolitan Club ('26), Ag. Club, Student Assistant Agriculture, Graduate Club, Holder of Philippine Scholarship ('27), F. S. C. M.
Football (2, 3, 4), Vice-President Theta Ribbon Society (2), Honor Council (4). CLAUDE LEON MURPHREE, Gainesville. Arts and Science, A.B. Latin Club, Baptist Club, University Organist (2, 3, 4). (3), Lakeland Club. John Marshall Debating Society, Intra-Mural Basketball and Tennis (2), Student Associate Editor State Law Journal (4), Seminole Staff (3), Blue Gator Staff (3), Contributor to Silver Bow (2), Law College Debating Team (4), Winner State Intercollegiate Poetry Prize (2), Florida Collegiate Press Association. THOMAS FRANKLIN NEWMAN, Tallahassee. Business Administration, B.S.B.A. Phi Kappa Phi, Beta Sigma, Leon County Club, Commerce Club, Student Assistant in Economics. WILLIAM COOK NORVELL, Lakeland. Law, LL.B. Sigma Alpha Epsilon. Cotillion Club, Theta Ribbon Society, Masqueraders, John Marsball Debating Society, Farr Literary Society, Theta Initiation Committee, Cotillion Dance Comnmittee. ED TODD O'DONALD, JACKSONVILLE, Arts and Science, B.S. Alpha Delta. Omega Pi, Sigma Delta Psi, Scabbard and Blade, Flint Chemical Society, Farr Literary Society, Duval County Club. Rifle Team, Episcopal Club, Track (1, 2, 3, 4), Intra-Mural Basketball and Baseball (1, 2. 4), Soccer (1. 2), Vigilance Committee, Executive Council, 1st Lieutenant Company "E", R. 0. T. C.
ELWOOD PILLS13URY PADGETT, Jacksonville. Arts and Science, A.BI. (1), Exchange Editor Alligator (2, 3), Editor F" Book (4). JOSEPH HUSKE PEARCE, JR. Tampa. Pharmacy, PH.G. and B.S. Pi Kappa Phi, Mortar and Pestle Society, Leigh Chemical Society. FRANCIS COOPER PELOT, Manatee. Arts and Science, A.B. ('26); Law College, LL.B. ROGER EARLE PHILLIPS, Orlando. Arts and Science. B.S. Delta Tau. Psi, Omega Pi, Leigh Chemical Society, Orlando Club, University of Florida Band, Orchestra, and Glee Club, Inter-Fraternity Baseball (2), Inter-Fraternity Swimming (1), Floridian's Orchestra (3, 4). KENNETH W. PIIEST, Tampa. Engineering, B.S.C.E. MARSHALL BREESE PROVOST, Cocoa. Business Administration, B.S.B.A. Kappa Sigma. 'Y Club, Serpent Ribbon Society. Basketball (1. 2, 3, 41. Baseball (3, 4). JENNINGS ALLIGOOD REHWINKEL, Crawfordville. Teachers, A.B.E. (President 4), (Reporter 1), Baptist Club (Secretary 4), Wauchula County Scholarship. BENJAMIN FRANKLIN RIDENOUR, Gainesville. Business Administration, B.S.B.A. 1st Lieutenant Company "C", Rifle Team (2, 3). GEORGE CORWIN ROBERTSON, Jacksonville. Engineering, B.S.M.E. Sigma Nu, Sigma Tau (President 3, 4 Benton Engineering Society (President), A. S. M. E., "F" Club (2, 3. 4), Track (1, 2). PAUL RUTHERFORD ROBERTSON, Vero Beach. Business Administration. B.S. in Journalism. Phi Alpha Epsilon, Freshman Debating Team, Class and College Basketball (1. 2), College Baseball (1, 2), President Fourth Estate Club. MARCUS AUREL ROSIN, Arcadia. Law, LL.B. Phi Beta Delta, Blue Key, Masqueraders, Business Manager Silver Bow (3), Business Manager "F" Book (4). Business Manager Blue Gator (4), Business Manager Alligator (5), Business Manager Masqueraders (41, Junior Prom Dance Commitce. SAM WALLACE RUSS, Tampa. Law, LL.B. John Marshall Debating Society, Tampa Club, Commerce Club, Farr Literary Society, Class Basketball (1, 2, 3), Hamburger Party. WALTER JOHN SCIUTTI, Jacksonville. Engineering, B.S.CH.E. Editor Seminole (31, Junior Prom Dance Committee, Intra-Mural Tennis Manager (5). WENDELL CREAGER SETZER, Olive Hill, Ky. Graduate School, M.S. ROBERT CHARLES SHIMP, Jacksonville. Engineering, B.S.CH.E. Gamma Sigma Epsi'on, Leigh Chemical Society, Benton Engineering Society, Duval County Club. FREDERICK RALPH SIAS, Orlando. Engineering. B.S.E.E. (1, 2, 3, 4), Captain Company "B". R. 0. T. C., Scabbard and Blade. ERVIN MASON SEAY, Dade City. Pharmacy. 1B.S. Sigma Nu, Sigma Delta Psi. Mortar and Pestle, Leigh Chemical Society, "F" Club, Serpent Ribbon Society. Basketball (2). Pasco County Club. MRS. ALMA SPENCER SLAGLE, Gainesville. Law. LL.B. Phi Kappa Phi. ALDEN CHAPMAN SMITH, Miami. Business Administration. BiS.B.:A. Delta Tau. Beta Sigma Phi, Alpha Kappa Psi (Vice-President 4), Cownr"c~ Club, (2. 3, 4), (Vice-President 2), Okeechobee Club (2). FOSTER SHI SMITH, Hawthorne. Arts and Science. B.S. (2~;Law. LL.B1. Phi Alpha Delta, "F" Club, Class Baseball ('21, '22), Class Football C21, '22), Varsity Baseball ('23), John Marshall Debating Society (1. 2, 3), Farr iterary Society ('22, '23. '24). EDGAR JAMES SMOAK. Pompano. Arts and Science. B.S. 2nd Lieutenant Company "D". R. 0. T. C.
Society, Y. M. C. A. Cabinet. IGNATIUS C. SPOTO, Tampa. Law, LL.B. Alpha Omega. Farr Literary Society (1), John Marshall Debating Society t2. 3, 4), University Latin Club (1, 2). (President 21. Hillsborough County Club, Intercollegiate Baseball (It, Football (1). and Boxing Team (4). BERWYN REED SPOFFORD. Jacksonville. Arts and Science, A.B. Phi Kappa Phi. University Orchestra (1), Farr Literary Society, Simpson Mathematics Club. RICHARD HARRISON SWAINE, Pensacola. Pharmacy, B.S. Mortar and Pestle, Leigh Chemical Society, Pensacola Club. M. L. STONE, Blountstown. Teachers, B.S.E. Pi Kappa Phi. Kappa Delta Pi, Peabody Club, Baptist Club, Debating Council, Inter-Fraternity Baseball, and Football (3). GEORGE LESLIE STEARNS, Jacksonville. Agriculture, B.S.A. Alpha Gamma Rho. Livestock Judging Team (2. 3. 4). CARL WILSON STEPHENS, Ona. Teachers, B.S.A.E. Ag. Club, Hardee County Club. Peabody Club. Baptist Club. WILLIAM EDWARD SWOOPE. New Smyrna. Engineering. B.S.C.E. Pi Kappa Phi. CECIL ASBURY THOMPSON. Gainesville. Arts and Science, A.Bl. Tau Kappa Alpha, Honor Court (4), Y. M. C. A. Cabinet (4), Varsity Debating Team (3), Farr l~iterary" Society. LEONARD RAYMOND TOY. Gainesville. Agriculture, B.S.A. Alpha Zeta, Thryus Club. Reporter Alligator (3) (4). CHARLES WESTON TUCKER. Jacksonville. Arts and Science, A.B. ORREN LEE VAN VALKENBURG, West Palm Beach. Engineering, B.S.C.E. (4), Gallery Rifle Team (2). MARCUS D. WALDRON, Chiefland. Pharmacy, Phc. Leigh Chemical Society (1. 2, 3), Mortar and Pestle Society (2, 3, 4), Levy County Club (3, 4), Basketball (2). Pharmacy Debating Team (3). JULIAN HOWARD WALLACE, Florence, S. C. Agriculture, B.S.A. Alpha Gamma Rho. SAMUEL DELMAR WALLACE, Griffin, Ga. Arts and Science, A.B. Pi Kappa Alpha. Scabbard and Blade, Football Numeral (1), 2nd Lieutenant, 0. R. C., Junior Prom Committee, Seminole Staff (2. 3), Inter-Fraternity Conference. BERTRAM DAVID WALTON, Miami. Pharmacy, B.S. Alpha Delta, Omega Pi, Leigh Chemical, Mortar and Pestle, Vice-President (41, Miami Club, Lieutenant Company "B" (4). FREI) CURTIS WARD, Eustis. Business Administration, B.S.B.A. Phi Kappa Phi, Beta Sigma, Alpha Kappa Psi, Scabbard and Blade, 1st Lieutenant Company -A". 77 _7OLIN ETHREDGE WATTS, JR., Gainesville. Arts and Science, A.B. ; Law, J.D. Phi Delta Theta, Phi Kappa Phi. Phi Delta Phi, Blue Key, Black and White Masque, Serpents, Masonic Club, President (4), Farr Literary Society, Polk County Club, Acacia Club, Cotillion Club, Honor Court (4), Democratic Club, John Marshall Debating Society, Vice-President Student Body (5). GARDINER WARREN WELCH, Gainesville. Arts and Science, A.B. MARION HUGUENIN WEST. Marianna. Law. LL.B. Phi Delta Theta, Phi Delta Phi. Phi Kappa Phi, Serpent Ribbon Society, John Marshall Debating Society. HIRAM ALLEN WHITTON, Ponce DeLeon. Teachers, A.B.E. Peabody Club, Baptist Club, Holmes County Scholarship. CONRAD JOSEPH WIERSTEINER. St. Petersburg. Law, LL.B. ANGELO DAVID WILLIAMS, Gainesville. Teachers, A.B.E. Peabody Club. RICHARD STARKEY WOODRUFF, Orlando. Law, LL.B. P1 Kappa Alpha, Pirates. Baronettes. Serpents, John Marshall, Freshman Football Numeral, Track (1, 2, 3), Pan Hellenic Representative (4), 2nd Lieutenant 0. R. C.
LEWIS THO-MAS WRAY, Nashville, Tenn. Law, LL.B. Phi Alpha Delta, John Marshall Debating Society. F. ELLIS WRAY, Avon Park. Engineering, B.S.E.E. Theta Kappa Nu, Benton Engineering Society, A. I. E. E., Highlands County Club, Hardec County Club, Math Club (2). 1st Lieutenant Company "E". HAROLD BUCKLEY YOUNG, Gainesville. Arts and Science, B.S. Pre-Medical Fraternity (Honorary). (2). Tennis (1, 2). Track and Football squad (1. 2), Alligator (1, 2). RAYMOND BARTLETT MARSH, Pensacola. Business Administration, B.S.B.A. (1, 2. 3). Serpent Dance Committee, "F" Club Dance Committee. HOLLAND CREVASSE, Inverness. Law, LL.B. University of Florida Band, J6hn Marshall Debating Society. 0. S. THACKER, Kissimmee. Law, LL.B. Phi Alpha Delta, Tau Kappa Alpha, Student Editor Florida State Bar Association Journal, Intercollegiate Debating Team. HAROLD L. SEB3RING, Gainesville. Law, LL.B3. Acacia, Blue Kev, Phi Delta Phi. John Marshall Debating Society. Thou hast our hearts entwined. Go forth, ye Florida men! The Orange and Blue shall ever winWe cannot conquered be! ARTS AND) SCIENCE Middleton. Conn.
W. T. ARNETT ENGINEERING Clermont, Fla.
V ,7 1 1 4LAW )St. Petersburg. Fia. -4 E. H. BEARDSLEY, JR.
*~ M. R. BEDSOLE, JRl. ARTS AND SCIENCE Jacksonville, Fla.
E. T. BOARDMAN ARTS AND SCIENCE Coral Gables, Fla.
W. A. BUHNER ARTS AND SCIENCE St. Petersburg. Fla.
G. L.. CARTER Comi EICE Jacksonville. Fia. ARTS AND SCIENCE Blountstown, Fla.
MERCER COX ARTS AND SCIENCE Wausau, Fla.
P. V. CUNNINGHAM ARTS AND SCIENCE >1 New Smyrna, Fla.
A. C. DEAN ENGINEERING Whitney, Fla.
C. P. DOUGLAS AGRIuCULTURE Jacksonville, Fla.
D. W. DIJCKWALL 'i rrARTS AND SCIENCE Bradenton, Fla.
: I r .. .
1 ER I3ER'r FRAZI ER 'll rrFla. A. E. HILLS ENGINEERING Winter H-aveil. Via. J. E. KEEZEL ARTS AND SCIENCE Winter Park, Fla.
C. S. LYTLE ARTS AND SCIENCE Bartow, Fla.
H. W. MYERS TEACHERS Mascotte, Fla.
ARTS AND SCIENCE Gainesville, Fla.
HAROLD MUNGER ARTS AND SCIENCE West Palm Beach, Fla.
ARTS AND SCIENCE New York, N. Y.
C. R. MATHIS, JR. ARTS AND SCIENCE Panama City, Fla.
MARION MARTIN ARTS AND SCIENCE Tampa, Fla.
J. J. McCRANIE ARTS AND SCIENCE Jacksonville, Fla.
P. A. NEUWIRTH ARTS AND SCIENCE Tampa, Fla.
P. D. O'CONNEL ARTS AND SCIENCE West Palm Beach, Fla.
Gainesville, Fla. WILLIE RICHARDS Tampa, Fla. ellIf. E,. RIDENOUR-, JR.
Ga MIMEsll. a Gainesville. Fla. Suh Jacksonville. Fla. J. RIVERS Gre Cove Springs, Fia. W. H. ROBERTS ARTS AND SCIENCE Homestead, Fla.
W. C. ROMPH _COMMERCE Miami, Fla.
BARKLEY ROSSER ARTS AND SCIENCE Jacksonville, Fla.
J. E. SAWYER AGRICULTURE 't" Mont Claire, N. J.
a E 13. SIIELFER, JRl.